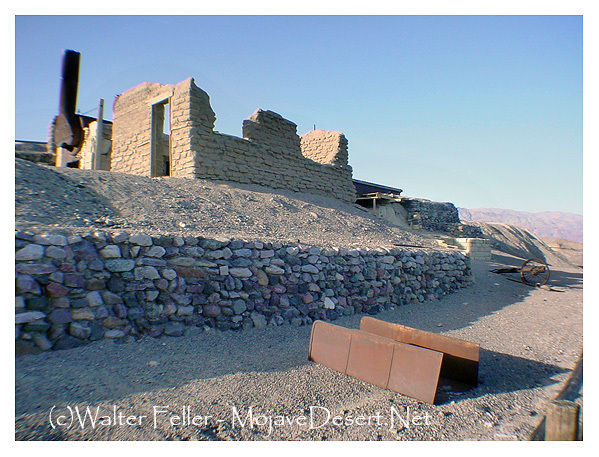 After borax was found near Furnace Creek Ranch (then called Greenland) in 1881, William Tell Coleman built the Harmony plant and began to process ore in late 1883 or early 1884. When in full operation, the Harmony Borax Works employed 40 men who produced three tons of borax daily. During the summer months, when the weather was so hot that processing water would not cool enough to permit the suspended borax to crystallize, Coleman moved his work force to the Amargosa Borax Plant near present day Tecopa, California. Getting the finished product to market from the heart of Death Valley was a difficult task, and an efficient method had to be devised. The harmony operation became famous through the use of large mule teams and double wagons that hauled borax the long overland route to Mojave. The romantic image of the "20-mule team" persists to this day and has become the symbol of the borax industry in this country. The Harmony plant went out of operation in 1888, after only five years of production, when Coleman’s financial empire collapsed. Aquired by Francis Marion Smith, the works never resumed the boiling of cottonball borate ore, and in time became part of the borax reserves of the Pacific Coast Borax Company and it successors. On December 31, 1974, the site was placed on the National Register of Historic Places. At present the Borax Works plant consists of a four-level ruin situated against a hillside. There are remains of buildings, machinery, tanks, piping, and waste tailings. In addition to the plant proper, a nearby townsite contains remnants of buildings and trash dumps relating to the company settlement. The entire complex is referred to as "Harmony Borax Works," or simply as "Harmony."